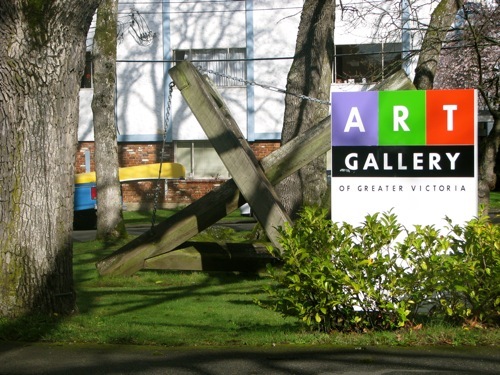 The Art Gallery of Greater Victoria (AGGV) celebrates the work of local artists at Victoria's largest studio. The 24th annual TD Art Gallery Paint-In is Saturday, July 16, from 11 AM to 4:30 PM outside the AGGV on Moss Street, between Fort Street and Dallas Road. The Paint- In features local 150 artists showcasing their works. Onlookers are invited to discuss materials with the artists, ask about their processes and even try their materials and mediums. In 2010, more than 35,000 people attended the family-friendly event. Activities include painting, pottery, sculpting, soapstone carving, papier-mache making and performance games. There's a tinge of green during the Paint-In this year, too. Reusable, foldable water bottles will be sold for a donation of $10. The AGGV bottle reads: GREEN is the new black -- Thanks for making ART sustainable in Victoria. Water bottle fill-up stations will be located along Moss Street, and bottled H20 will not be sold. Other green initiatives include composting and recycling bins. A food and beverage garden, located in the gallery parking lot, will be open from 11-9 during the TD Art Gallery Paint-In. Latin band KUMBIA will play dance favorites from 5-9 PM. Indoors, the Art Gallery of Greater Victoria will be open from 10-6 (by donation). Exhibitions currently showing include A Brush with War: Military Art from Korea to Afghanistan; War and Disaster in Japanese Prints, The Further Adventures of GIRL and the ongoing Emily Carr: On The Edge of Nowhere.